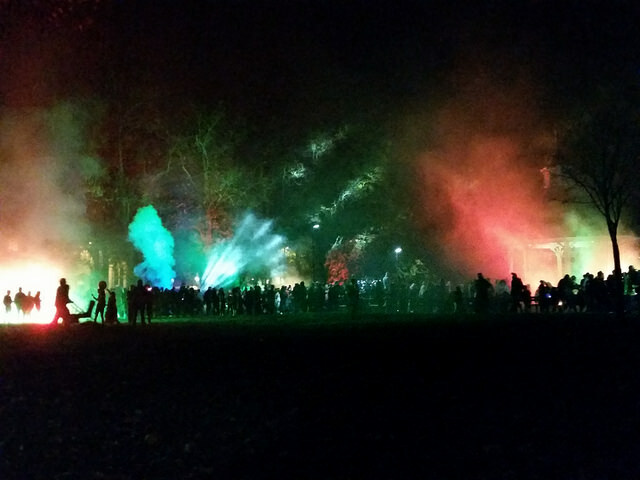 It started off after dark in Chapelfield Gardens which were lit up with green and red lighting with puffs of smoke everywhere. 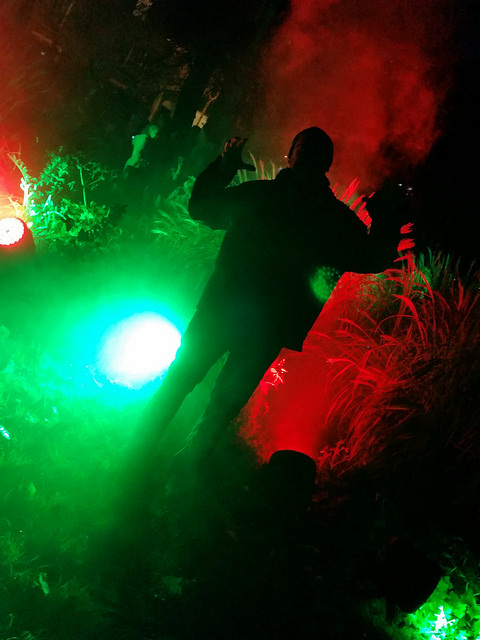 It created a good spooky atmosphere and as we walked around we saw lots of families taking photos of their children in front of spooky smoky bushes. I didn’t have any children to photograph so I got Nigel to stand in for me! I asked him to look scary – I’m not sure that he does “scary” very well as you can see! There was also entertainment in the Gardens around the bandstand as young local performers sang and danced. After a while a procession began to form and we watched as Halloween characters filed past in the procession. 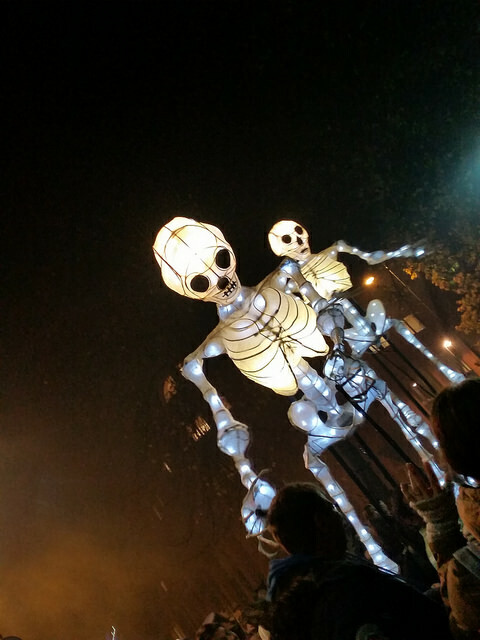 The giant illuminated skeleton puppets were brilliant and moved around in an almost life-like way. The crowd then followed the procession to the front of City Hall which was decked out Halloween style with green and red lighting and ghosts hanging from the two lions that flank the building entrance. Spooky music played too. After the procession had gone past, there were another two performances from the singers and dancers both of which I really enjoyed. Finally they got the crowd dancing the steps to one of the songs which everyone seemed to enjoy. In fact my lasting memory of the evening was turning round at one point and seeing a big crowd of smiling faces behind me! I hope the council put Spooky City on next year too :). Spooky City was a free public event for Halloween organised by Norwich City Council and consisted of entertainment in Chapelfield Gardens, a spooky procession & more entertainment in front of the Forum and City Hall.